A unique dining experience within the vaulted crypt of St Paul’s Cathedral – a romantic restaurant in the most unusual and fascinating setting and, up until now, largely undiscovered. Enjoy contemporary modern European dishes for lunch and afternoon tea in relaxed and comfortable surroundings with a special menu for children. A perfect venue for business meetings and functions in this amazing setting. Or for a simple snack, a drink or a coffee visit the self-service Crypt Café. 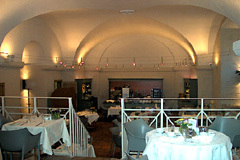 Restaurant open every day 11am-5pm, Crypt Café 9am-5pm. All major credit cards accepted (not Amex). No service charge. Modern European dishes served for lunch - also daily special fixed price menu. Didn't know the forum rules allowed such brnilialt posts.